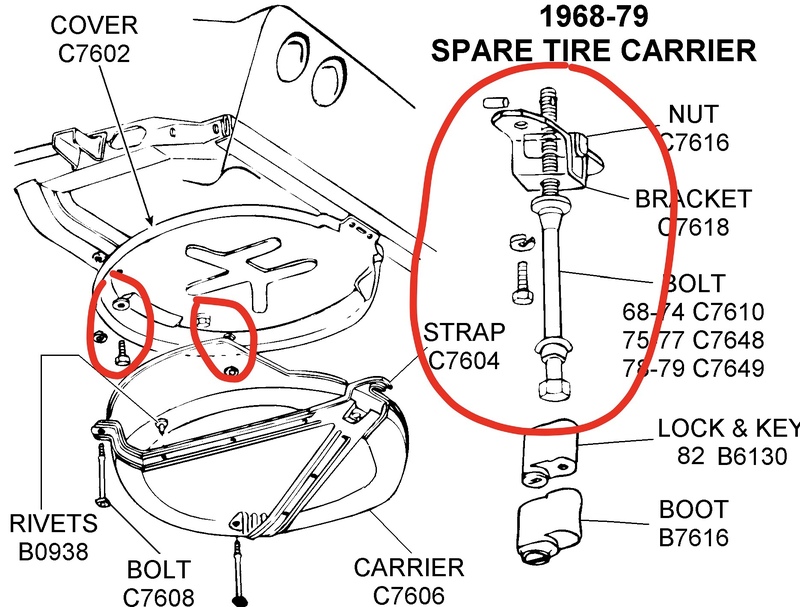 Hi, I’m looking for a c3 jack, the lug brace, retaining spring, the 2 fwd bolts that hold the upper spare tyre tub in place, plus the rear spare tyre tub mount/release bolt assembly if anyone has any of this for sale? Mines a 74, but not worried about year specific jack as long as it fits! Yes, but also be aware that there are some Jacks out there for a C3 $200 or more that are for show use ONLY ie not dedicated to lift your Vette.. I have the Scissor Jack, but also carry a small Hydraulic Jack for ease of lift, but I need the Scissor Jack to start the lift as it clears the Chassis rails if I have a full deflation. Hi, yes I’ve seen the ‘show’ jacks, nearly bought one until I noticed it. I’ve seen a couple of used ones in the states, around the $150 mark, so I think I’ll buy one of those. I’ll buy the other bits from CK, price isn’t massively more than importing, and quicker delivery! Hi, yes I did, Sod’s law it comes up after buying in the states 4 weeks ago.